We all know how important arm development is to an impressive physique. Arm development, possibly more than any other body part, can completely change the look of somebody from simply average to superhero status. It is no wonder that in a typical gym setting, you see people training their arms more than any other body part. The problem is, arm development is very elusive for most people. However, using proper planning, organizing and execution, it is possible to develop some commanding arms to be proud of. The question is: How to design an optimal workout for overall muscle definition and size? There is a lot of variability from one individual to the next, but herein are general guidelines and exercises that would work for most people. If proper form and function are being paid attention to appropriately, then exercise selection will make a massive difference in muscle development results. Knowing when and when not to do a particular exercise or where it should be placed in your program will be of great value and pay off big time in the long run. 1) The first exercise for each muscle group (below) starts with an exercise to work the muscle in the “short” position (think about squeezing as hard as you can). You’ll get more power output, and you’ll be able to “feel” that muscle better for the rest of the workout. 2) From there, I’ve planned out an exercise to use heavier loads than the first movement, with more central nervous system stimulation. However, be sure to keep form on point even while working with a heavier weight. 3) Finally, each muscle group finishes with an exercise to stimulate the muscle in a lengthened position where you likely will still be able to generate strength from. In order to get the best benefits from the exercises below, prioritize them in order of their importance for your goals. If you find that your shoulders are lagging, but your biceps look pretty boss, then start with shoulders and end with biceps. Every six weeks, re-assess your goals and plan your program accordingly. Turn so the body faces a high pulley system laterally. With the cable making an extension of the outstretched arm and elbow high, keep the elbow from moving up or down, but rather move it like a hinge so that the hand ends up behind your head. Initiate the movement with the biceps. To help conceptualize this, think about posing your biceps for a social media selfie. The goal of this particular exercise is to spend some time in the short position, so a 1 to 2 second contraction is recommended. 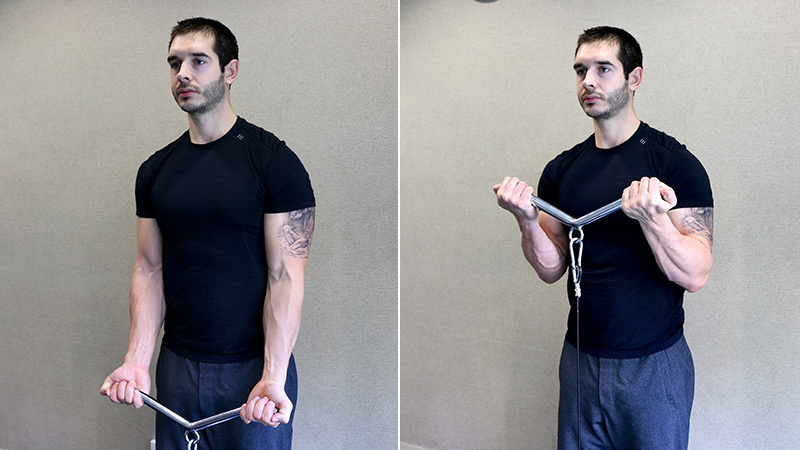 Facing away from the cable apparatus, grab the bar shoulder width grip or slightly wider. Keep the bar slightly off the thighs, and elbows locked in that position. 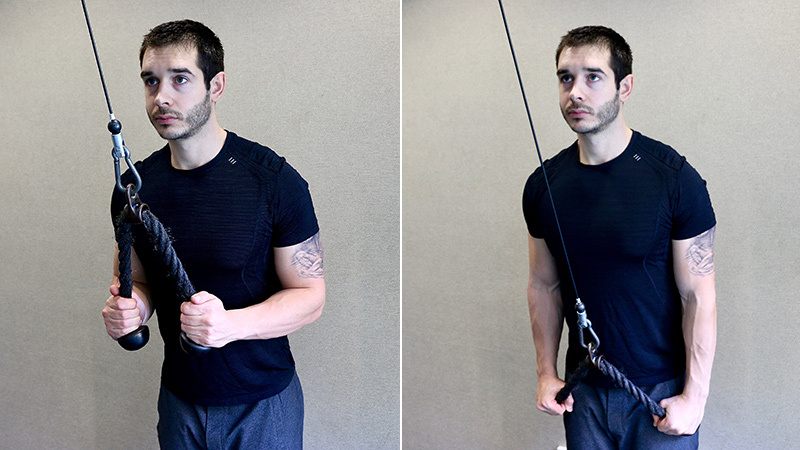 Don’t let the elbows move forward or backward during the curl. From there, curl the weight up just before losing tension on the biceps. The goal isn’t to make the exercise easy by resting at the top of the position, with the wrist and elbows stacked on top of each other. Then, slowly (3 to 4 seconds) lower the weight to the starting position with a fully lengthened biceps. 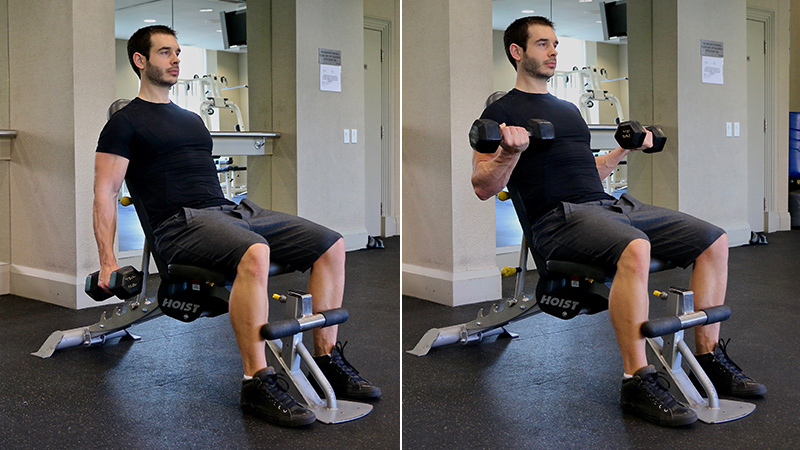 With the bench set up on a slight incline, grab a pair of dumbbells with palms facing each other. Curl the weight up and as you do, turn your pinkie fingers inward (supinate). As with the previous exercise, stop short of stacking the wrists and elbows. The goal is to still have tension on the biceps at the top of the movement. Then slowly lower the weight (3 to 4 seconds) to the starting position in a fully stretched biceps position. Grab the rope and take a step backward. This will offer more resistance when the elbow is at full extension. Hands will be slightly wider than shoulder width, and elbows stationary. 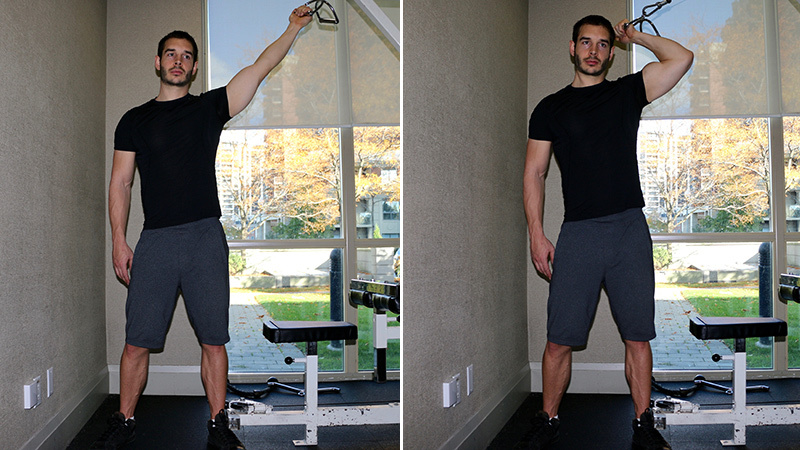 Extending the elbow like a hinge, straighten the arms until a full triceps contraction. Hold that position for 1 to 2 seconds, trying to squeeze the triceps a little more, and then return to the starting position (3 to 4 seconds). 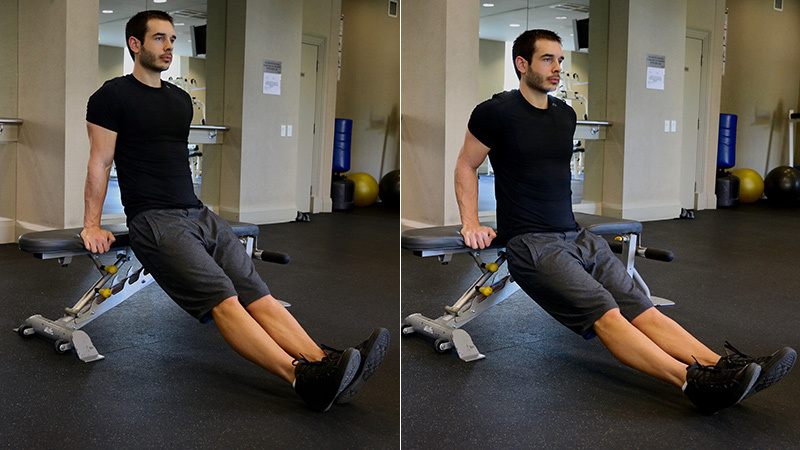 Lying supine on a bench, elbows toward ceiling while shoulders flush on the bench so that the upper arm is slightly behind perpendicular to the floor. This will keep tension on the triceps during the set. Lower the dumbbells to roughly 90 degrees at the elbows so that the dumbbells are behind the head, taking 3 to 4 seconds to do so. Then extend the elbow back to the starting position. Think about moving the weight in an arc, rather than just an “up and down” motion. With knees straight and hips flexed, maintain a horizontal trunk position. Lowering the body while keeping the arms from flaring, stop the movement before you begin to extend excessively at the shoulder joint. Make the movement all about what is happening at the elbow, rather than the shoulder. A variation would be with knees bend to take the load off the triceps and make the exercise easier as a beginner, or as you fatigue during the workout. This move is a little more involved, so pay particular attention to the execution cues. 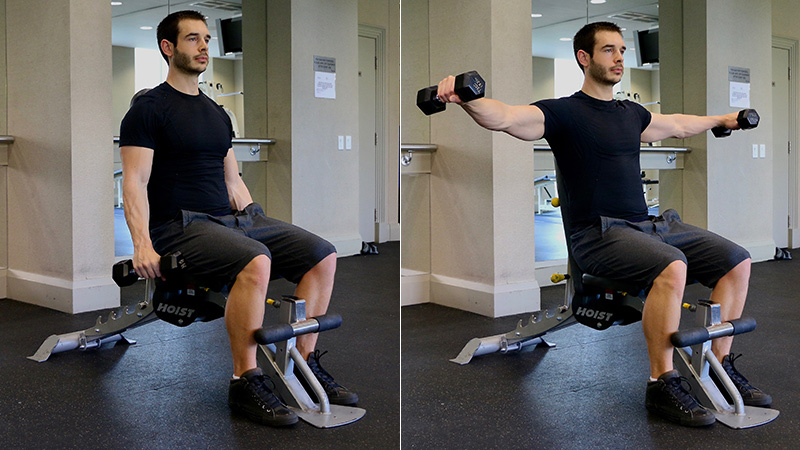 Start seated, with the dumbbells 6 inches from the thighs. This will ensure constant tension on the delts, even from the starting position. From there, perform a biceps curl with palms facing each other so that the elbows make a 90-degree. 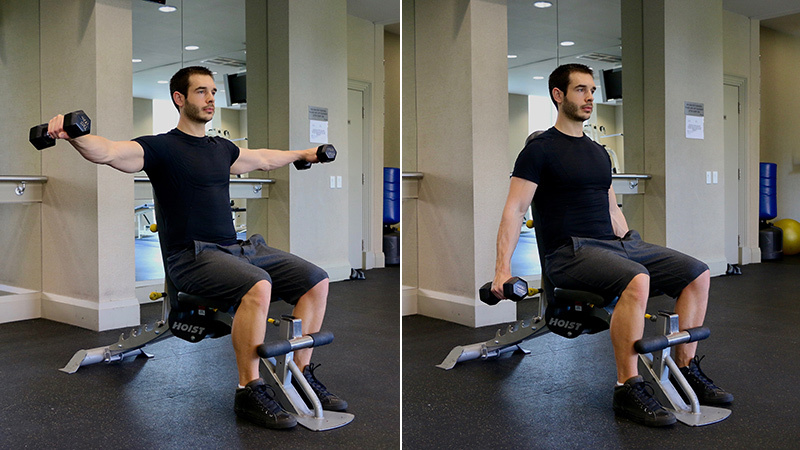 In one fluid motion, move the elbows laterally, keeping the dumbbells outside of shoulder width. Now, for the fun part. With control, extent the elbows out to a full extension and then slowly lower the weights back to the starting position (3 to 4 seconds). Start seated as to avoid any assistance from the lower body. 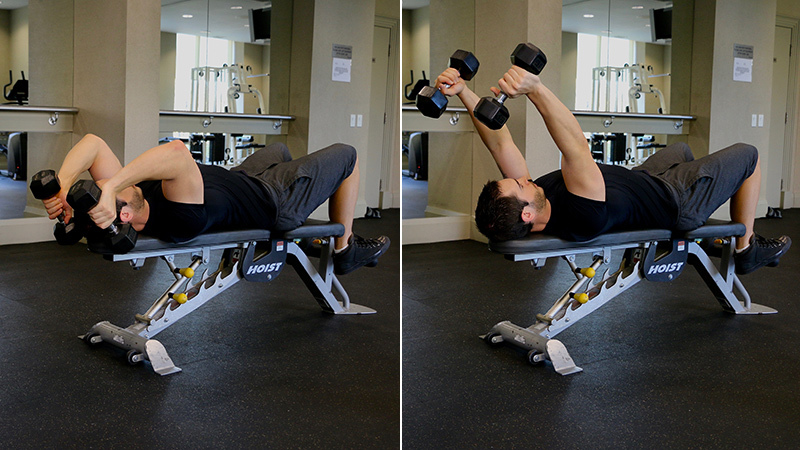 Dumbbells will be outside of shoulder with the entire time, starting with elbows at 90 degrees. Although this movement challenges the muscle in the short range, it is also a great exercise for overall output to finish with because you can extend the set as you fatigue. 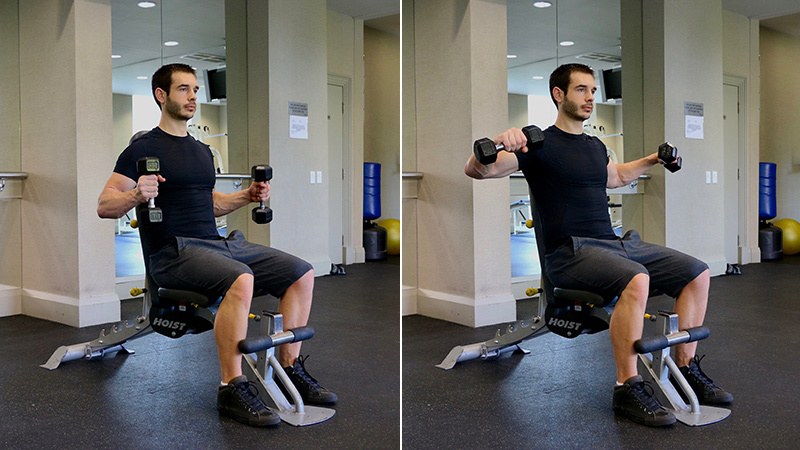 To start out, the dumbbells should be 6 inches off the thighs to keep constant tension on the shoulders. Keeping the shoulder depress (don’t shrug), think about reaching for the floor and then the side of the room as the weights are raised so they are in line with the shoulders and slightly ahead. 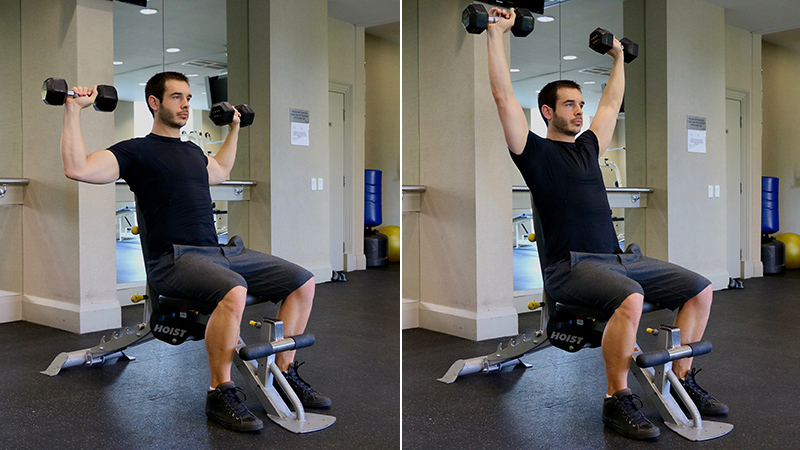 Then slowly (3 to 4 seconds) lower the weights to the starting position. If you are getting fatigued, but can keep your form from swinging and using momentum, it would be appropriate to work the movement in the bottom ½ of the range to totally exhaust your muscle fibers at the end of the set.